Dr Warren Pratt has joined Condor as a senior geological consultant and will focus on the exploration upside. He is producing a detailed geological, stratigraphic and structural map of La India Project. "Following on from the successful structural geology study last year, which identified 33 new exploration targets, and a 71 km² soil survey that identified an additional 13 new exploration targets, Condor recently initiated a further 242 km² soil survey programme at La India Project aimed at identifying additional prospects and demonstrating the district-scale gold potential of La India Project. Recent work by Condor geologists has identified a 12.5 km long mineralised corridor 9 km to the north of La India open pit. A high grade rock chip of 53.9 g/t gold at the northern end of the Andrea-Limones mineralised corridor, some 6 km away from the nearest gold mineral resource, is highly encouraging. Follow up trenching is being planned in the area. I am delighted that Dr Warren Pratt has joined Condor as a senior geological consultant. He will advise the Board on the exploration upside of La India Project. Earlier this month he spent two weeks at Mina La India and will lead the production of a detailed geological, stratigraphic and structural map across the entire District. Dr Pratt contributed to the due diligence ahead of the recent investment in the Company by Ross Beaty and strengthens the geological team." In 2015 Condor geologists completed a regional B-horizon 53 element ultra-trace soil geochemistry survey (a soil survey) comprising 6,156 samples covering 71 km². 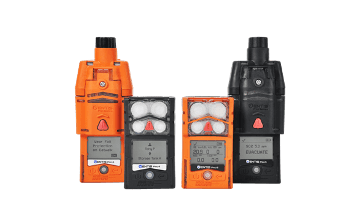 This included an initial phase of 5,767 samples over 55 km² on a 200m by 50m grid with some 100 m x 50 m infill sampling in La India South - Mojarra Area and a second phase of 389 samples over 16.3 km² collected on a 400 m by 100 m grid over the interpreted northwest strike extension of the El Tanque structure. A detailed review of the results identified thirteen exploration targets, including five priority targets with overlapping gold, upflow and high level indicators and a further seven targets with coincident gold and upflow indicators. Also in 2015 senior consultant structural geologist Dr Tony Starling of Telluris Consulting Ltd completed a study on the structural geology of the La India Gold District. This work represented a stepwise improvement in our understanding of the structural evolution of the district geology and defined the favourable structural orientations that control the flow and deposition of epithermal gold. Dr Starling identified 33 exploration targets, 23 of which have known gold veining at surface (See RNS dated 15th September 2015). Follow up geological mapping and prospecting has been carried out over the majority of the areas covered by the soil survey and structural geology study since the fourth quarter of 2015. 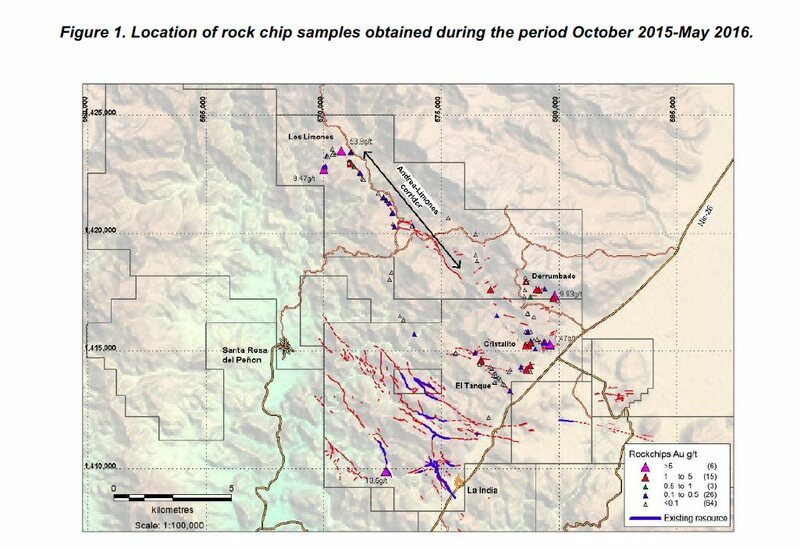 During this period a total of 114 rock chips were sampled (figure 1) of which 15 samples have come back with gold values of 1-5 g/t and 6 samples with gold values > 5 g/t, including a 53.9 g/t sample from a new site in the Los Limones area, at the very northwest end of the Andrea vein structure. This is significant when put into the context of the high level epithermal characteristics observed in this area, including opaline quartz, sinter and silicified wood fragments. Several rock chips with anomalous gold values identify a possible NW striking 1.5 km structure to the southeast of the El Tanque prospect. This structure was identified as a target in Dr Starling's structural geology analysis. Rock chips have characteristic high level quartz textures and lie 70-140 m topographically above high grade samples in the main El Tanque prospect (figure 1), possibly indicating that mineralization at depth can be extended to the southeast. The soil survey identified a gold anomaly along a corridor that extends from the southernmost surface exposure of the Andrea vein down to the Cristalito prospect, approximately 4.5 km to the southeast. Prospecting to date has not been able to identify a surface expression of the continuity of the Andrea vein to the southeast, but high level textures and surface silica deposits identified recently, may represent the surface expression of a deeper level mineralized structure that connects the Andrea vein with the Cristalito prospect. To the northwest of the Andrea vein, several rockchips with anomalous gold values and boiling textures were collected in an area previously not sampled that connects the Andrea vein to the Los Limones area, where high grade veins have been sampled, including a 53.9 g/t Au. These findings indicate that the NW mineralised corridor possibly extends for 12.5 km from the Cristalito prospect northwest to Los Limones area. Figure 1. Location of rock chip samples obtained during the period October 2015-May 2016. During the first week of June 2016, Condor initiated a district wide soil sampling survey to cover the remaining areas of Condor Gold´s concession package in La India project, not covered by the 2015 survey. An estimated total of 6,300 samples will be collected covering an approximate area of 242 km2. The fine-fraction B-horizon soil samples will be analysed for 53 elements at ultra-trace detection limits at Bureau Veritas Laboratories in Vancouver using standard ICP-MS method. The survey will be carried out using three different sampling spacings (figure 2). A core area covering the main area of known veins in La India concession will be sampled using a grid of 200 x 50 m. The northwest mineralized corridor within the El Rodeo concession will be sampled with a grid of 400 x 100 m. The rest of the areas within the concession package will be sampled at a wider spacing of 400 x 400 m.
Sampling and interpretation of results is planned to conclude by the end of 2016. Infill sampling of geochemical anomalies in the widely sampled areas will be conducted in 2017 to better define the prospects. Figure 2. 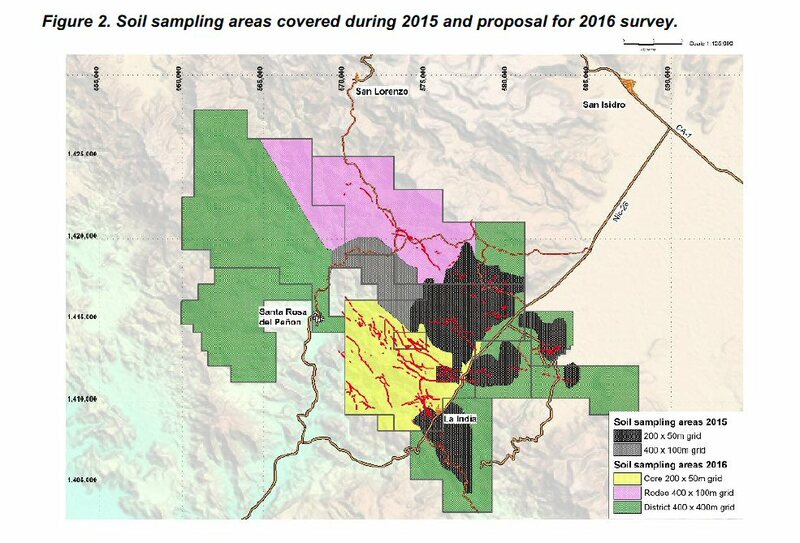 Soil sampling areas covered during 2015 and proposal for 2016 survey. Condor has engaged Dr. Warren Pratt of Specialised Geological Mapping Ltd. as a senior geological consultant who, together with Condor geologists, will carry out detailed geological, stratigraphic and structural mapping of La India District. Dr. Pratt will also train Condor´s geologists and establish a methodology for mapping and core logging in order to standardise data collection and interpretation procedures. Dr. Pratt (BSc Geology, Hull, 1986; PhD Structural Geology, University of Wales, 1990) is the founder of Specialised Geological Mapping Ltd. and has a decade of British Geological Survey field experience and extensive world-wide field mapping experience in a great variety of geological terrains. Since 1995 he has worked extensively in gold, silver and copper exploration, including consulting on some World Class mineral deposits. These include Navidad (Argentina) and Ventana Gold (Colombia). Dr Pratt has a track record of generating gold/copper targets in under- explored areas, including the Cañicapa high sulfidation gold project, discovered during a World Bank program in Ecuador. He is also part of the team that recently discovered the Igor gold/silver epithermal deposit (Peruvian Precious Metals Corp) in Peru. The information in this announcement that relates to the mineral potential, geology, Exploration Results and database has been reviewed by Peter Flindell, Senior Geological Consultant, who is a Member of the Australian Institute of Geoscientists and Australian Institute of Mining and Metallurgy, and a geologist with thirty years of experience in the exploration and definition of precious and base metal mineral resources. Peter Flindell is a Non-Executive Director of Condor Gold plc and has sufficient experience which is relevant to the style of mineralization and type of deposit under consideration, and to the type of activity which he is undertaking to qualify as a Qualifying Person as defined in the June 2009 Edition of the AIM Note for Mining and Oil & Gas Companies. Peter Flindell consents to the inclusion in the announcement of the matters based on the information in the form and context in which it appears and confirms that this information is accurate and not false or misleading. B-horizon soil The organic-poor soil horizon consisting of typically brown coloured completely weathered rock material with no primary textures. This horizon often occurs beneath the organic-rich A-horizon and contains some organic material such as roots are usually present. Geochemistry Geophysics The study of the elements and their interaction as minerals to makeup rocks and soils The measurement and interpretation of the earth's physical parameters using non-invasive methods such as measuring the gravity, magnetic susceptibility, electrical conductivity, seismic response and natural radioactive emissions. Hydrothermal Hot water circulation often caused by heating of groundwater by near surface magmas and often occurring in association with volcanic activity. Hydrothermal waters can contain significant concentrations of dissolved minerals. 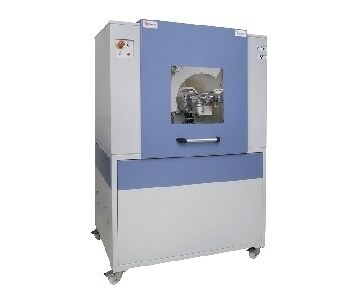 ICP-MS (Inductively Coupled Plasma Mass Spectrometry) A technique that measures the concentrations of elements in a substance, such as a rock, by dissolving the substance in a solution, typically an acid, ionizing a sample and separating the ions to measure the relative concentrations based on their mass-to-charge ratio. 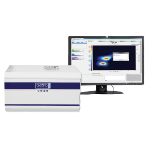 The technique is capable of measuring very low concentrations with high precision. Magnetic (aeromagnetic) survey The measurement of the magnetic properties of the earth surface as controlled by the concentration and distribution of magnetic minerals, particularly magnetite, in the rock. Rocks containing higher levels of iron, such as mafic igneous rocks or some sedimentary rocks will have a higher magnetic susceptibility than felsic igneous rocks, siliciclastic and carbonate sediments and their metamorphic derivatives.. Mineral Reserve The economically mineable part of a Measured and/or Indicated Mineral Resource. It includes diluting materials and allowances for losses, which may occur when the material is mined. Appropriate assessments and studies have been carried out, and include consideration of and modification by realistically assumed mining, metallurgical, economic, marketing, legal, environmental, social and governmental factors. These assessments demonstrate at the time of reporting that extraction could reasonably be justified. Ore Reserves are sub-divided in order of increasing confidence into Probable Ore Reserves and Proved Ore Reserves. Radiometric Also known as gamma ray spectrometry, is the measure of natural radiation on the top 30- 45cm of the earth's surface. The abundance of the three naturally occurring radioactive elements, potassium (K), thorium (Th) and uranium (U), is proportional to the abundance of minerals containing those elements. This information can be used in mapping the surface geology including the definition of areas of potassium enrichment related to hydrothermal alteration. Stockwork Multiple connected veins with more than one orientation, typically consisting of millimetre to centimetre thick fracture-fill veins and veinlets. Strike length Vein The longest horizontal dimension of an ore body or zone of mineralisation. A sheet-like body of crystallised minerals within a rock, generally forming in a discontinuity or crack between two rock masses. Economic concentrations of gold are often contained within vein minerals.